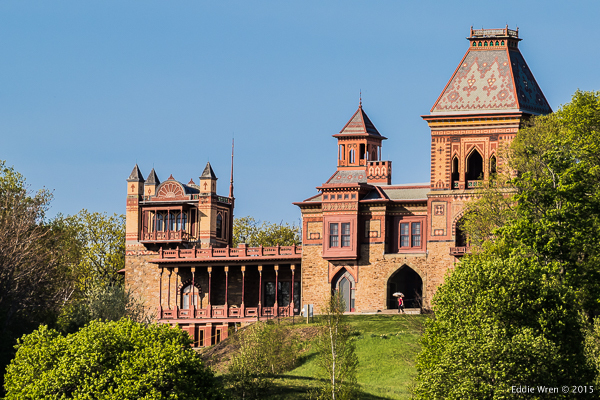 It could be argued that if ever architecture looked out-of-place for its location it is at Olana, in the Hudson Valley, New York State, on the east bank of the river, on the opposite side to the town of Catskill. It’s origins, however, are of significant artistic interest. I paid two visits to the grounds (which is free on weekdays but costs just a few dollars for admission on weekends and public holidays), once in late April and again early in May. As I was short of time on both of these occasions I limited my walks to a lap of the man-made lake although there are several other walks available to visitors. 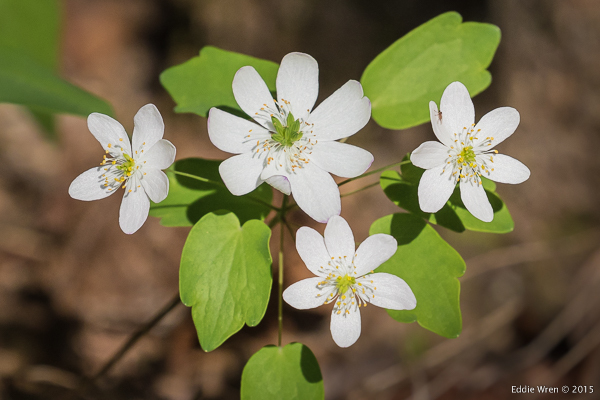 On both of my visits only a couple of spring ephemerals were present: Rue Anemones and Hepatica, although the latter was past it’s best on my May walk. 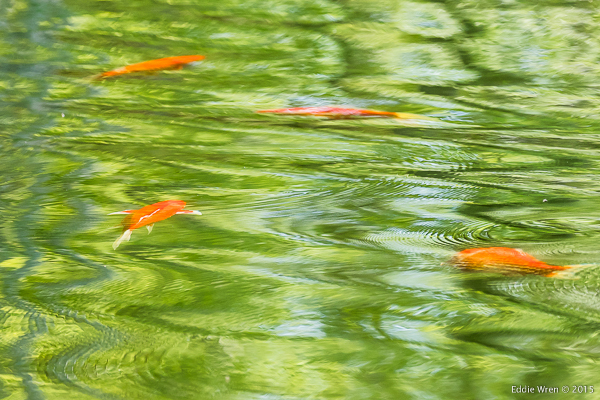 As for the lake itself, I have been here a few times but this was the first time I was able to see that there are some Koi carp present (either that or some very large goldfish, if that’s not the same thing!). The other non-native that was present, but fortunately in very small quantities was the invasive reed Phragmites. Much more interesting were the male Common Green Darner dragonflies that were patrolling sections of the shoreline, waiting for the arrival of females. Several birds were present, though I didn’t get good photos of as many as I usually manage. I certainly expected to see more species of migrating warblers passing through but disappointingly that didn’t happen. 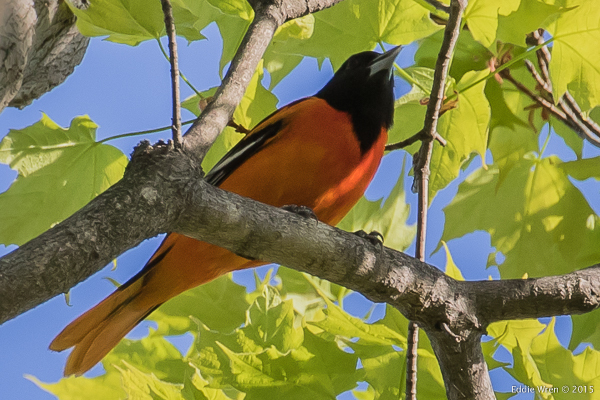 The two species that did surrender to my lens were the ubiquitous America Robin and the spectacular Baltimore Oriole. My bird ‘stalking’ usually gets more prolific results! 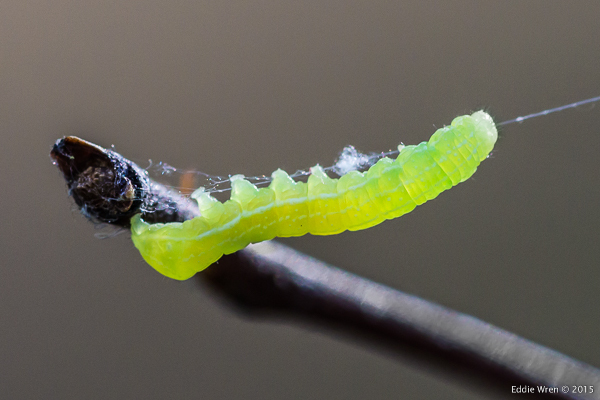 Corrected caption: NOT an Inch Worm but likely a Noctuid moth caterpillar! 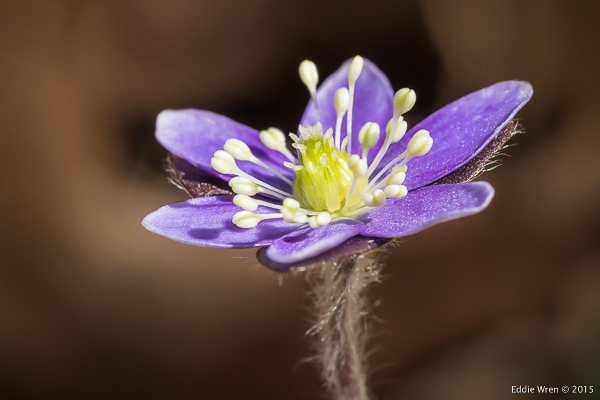 While I was there, though, what I took to be an ‘inch worm’ dangling in the sunshine caught my eye. Most Americans undoubtedly have seen inch worms but after I got home from this walk I looked it up and was staggered to find the claim that there are, in fact, over 1400 different species of inch worm in North America! To check further, I sent the above photo to someone vastly more knowledgeable than I about entomology and their response was that this was not even an inch worm – a fact given away by the number of pairs of ‘sucker’ legs! Instead, this is likely to be the caterpillar of a ‘Noctuid’ species of moth, and there are hundreds of different species of those, too! My thanks to ‘Ask An Entomologist’ – on Twitter @BugQuestions – for this information. This entry was posted in Architecture, Birds, Capital District, Dragonflies (Anisoptera), Fish, Flowers, Frederic Edwin Church (artist), Insects, NY State, Odonata, People, Photography - Wildlife & Nature, Thomas Cole (artist), Water Bodies and Wetlands, Wildlife - Nature - Natural History and tagged Architecture, Artists - famous, Artists' homes, Flowers - ephemerals, Historical individuals, Hudson River School (artists), Hudson Valley NY, nature photography, New York State, Spring.